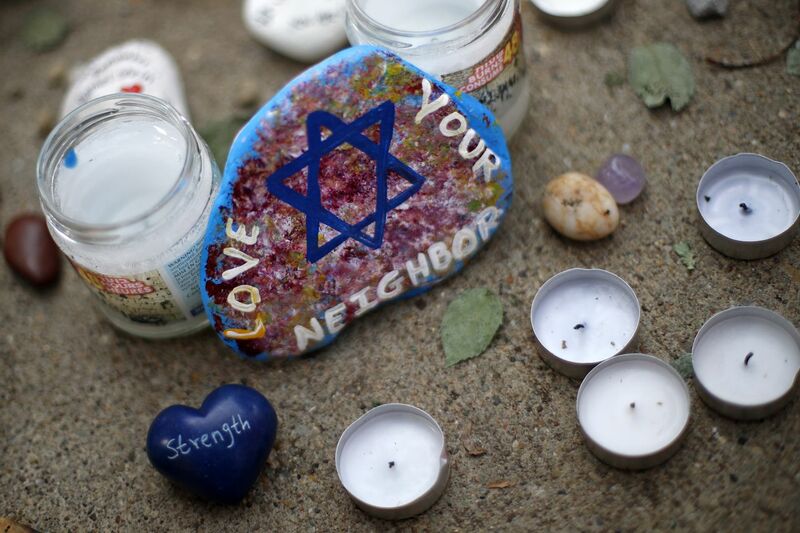 This is a painted rock found Wednesday, Oct. 31, 2018, part of a makeshift memorial outside the Tree of Life Synagogue in the Squirrel Hill neighborhood of Pittsburgh, to the 11 people killed during worship services Saturday Oct. 27, 2018. I'm not religious. I've always said that I am a Mel Brooks Jew — I'm in it for the jokes and the shared language of a communal experience. Spaceballs keeps me close to God. I go to work on Jewish holidays, avoiding the hours of contemplative prayer but not the family dinners. The most Jewish tradition I observe is watching The Ten Commandments on TV every year. But since last Saturday, when 11 Jews were massacred inside a synagogue in Pittsburgh, I have never felt more Jewish. I experienced something similar last year, when neo-Nazis with Tiki torches traversed Charlottesville espousing hatred for something about me that I could not change. But that feeling of terror passed. I'm not sure this one will. From a young age, Jews are taught about our collective suffering. We were slaves in Egypt, we were exterminated in Europe, we faced persecution at home. I have experienced anti-Semitism myself, but it felt like a mild annoyance, almost harmless. A homeless man who lived outside the store where I worked in college used to remind me that I caused Sept. 11 (until I gave him pizza, and then we were buds); when I was a reporter, angry readers would aggressively remind me that they knew what religion I was based on my last name and picture, and call me the attendant slurs. It was easy to shake off those incidents. Because those people were nuts, right? And all reporters get hate mail? And I was safe, right? And even in the wake of Charlottesville, I could find hope in the protesters who wouldn't let neo-Nazis take over a city without a fight, in the bravery of Heather Heyer's mom, who — like Trayvon Martin's parents before her — refused to let her daughter's death be in vain. As American Jews have assimilated, the most heinous sort of anti-Semitism, the kind we saw in action last weekend, has come to feel literally foreign. It happened in other places. In times before. But this time is different. This time, I'm unable to shake it off. Yet, that refrain of suffering and tragedy — always coupled with resilience and hope — remained, and bonded me to a community I was tied to by birth but had only selectively chosen to participate in. We suffered, but we made it. What came into stark relief on Saturday was that a bigot with a gun doesn't really care if you can quote more of The Producers than the Torah. His victims were people presumably more of the latter than the former. But I'm sure he didn't care. My pre-Squirrel Hill naivete was a privilege gained from growing up in a place and time where being Jewish does not necessarily make one feel like the member of a minority group. And, importantly, my identity is not written on my skin as it is for people of color. But you know, I think that my forefathers and foremothers would be pretty pleased that I got to grow up with that privilege, that the degree to which I was marked as different was my choice and not anyone else's. After Charlottesville, after Squirrel Hill, I don't have that privilege anymore, and for that, my ancestors who traveled on boats from Europe to get here would be extremely unhappy. My grandmother, for one, would be devastated. And that is one of the things that makes me saddest of all. Am I going to change my behavior after the tragedy at the Tree of Life synagogue? Will I go to High Holiday services and start praying on a regular basis, start to believe in a way I didn't before? No, I know myself and I won't. But I will embrace my religious identity in a way I never have before, because I don't have the privilege to opt out. Molly Eichel is the arts and lifestyle editor of the Inquirer.